Massive investments in Bangladesh's oil and gas sector are creating considerable opportunity for U.S. firms to supply equipment or bid on some of the many projects planned through the year 2000. As of mid-1992, Bangladesh's proven oil reserves were estimated at 7.6 million barrels and average crude oil production was 220 barrels per day. The most recent official estimate of gas reserves in Bangladesh reports 10,700 billions of cubic feet (BCF) of recoverable reserves at 1,100 wellhead pressure per square inch (PSI) and 15,000 BCF at 500 wellhead pressure PSI. Most observers believe that with a concerted exploration program, Bangladesh could easily increase reserve levels. About $508 million is slated to be invested in the oil and gas sector over Bangladesh fiscal years 1992-94. Reliable sources indicate there is scope for $800-1,200 million in investment in this sector up to the year 2000. The average daily demand for gas in Bangladesh is 732 million cubic feet, of which the power sector consumes 47 percent, the fertilizer sector 35 percent, the industrial sector 10 percent, and the commercial sector 2 percent. Gas contributes almost 80 percent of the country's daily energy requirement of 2,200 watts. Every year, Bangladesh imports about 100,000 metric tons of crude oil from the Abu Dhabi National Oil Company, the Saudi and American Corporation, and the National Iranian Company. Petroleum imports typically include about one million metric tons of high sulphur distillate, 250,000 tons of SKO, and 100,000 tons of Jet A-1 each year. Mobil Sales and Supply Corporation and Esso/Exxon supply 35-40 percent of these needs. The Bangladesh government does not allow foreign firms to sell finished lubricants, but does import about $12 million of lubricating base stock annually from Mobil, Esso, Shell, and British Petroleum to make basic lubricants. The World Bank and Asian Development Bank fund procurements for most oil and gas equipment and projects. During Bangladesh Fiscal Year (July 1-June 30) 1991, imports of oil and gas equipment totaled $44.5 million and the United States had a 6 percent market share. Fiscal years 1990 and 1989 saw imports of $42 million and $8.2 million, respectively. The Bangladesh Oil, Gas and Mineral Corporation (BOGMC-popularly known as Petrobangla) and Scimitar, a Canadian-owned oil and gas exploration firm, are the only importers of oil and gas equipment. * a third natural gas project (the tender for this $50-60 million ADB-financed project will likely be floated in early 1993 and will require large imports of drilling pipes and surface facilities). Although the Ministry of Energy and Natural Resources does not do any contracting directly, it is a key player since it formulates government policy for the oil and gas sector and often exercises operational control over Petrobangla and its seven subsidiaries. Basically, Petrobangla is responsible for exploration, drilling, production, and distribution in the oil and gas sector. The company may enter into production sharing agreements with foreign oil and gas companies, although in practice such decisions ultimately are made at the cabinet level. 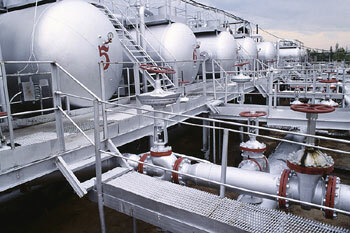 Petrobangla's subsidiaries engaged in oil and gas production are Sylhet Gas Field Ltd., Bangladesh Petroleum Exploration Company, Bangladesh Gas Fields Co. Ltd., and Rupantarita Prakritik Gas Co. Ltd. Petrobangla has three firms engaged in distribution: Titus Gas & Distribution Co. Ltd., Bakhrabad Gas Systems Ltd., and Jalalabad Gas So. Ltd. In addition, the Bangladesh government owns the Bangladesh Petroleum Corporation, which imports, refines, markets, and distributes petroleum and petroleum products in the country. Best sales prospects for the next few years include drilling rigs, control panels, sub-surface equipment, valves, oil and gas measuring equipment, dehydration plants, fractionation plants, centrifugal pumps, and heat exchangers. There is a 20 percent tariff, 15 percent value added tax, and an extra 2.5 percent tax imposed on this equipment. U.S. Embassy analysts encourage U.S. firms interested in selling equipment or bidding on projects to consider appointing a local agent to keep them apprised of upcoming opportunities and to take care of bidding procedures which only someone on the spot can handle. Embassy analysts point to the U.S. firm, Cherrington Asia Inc., as an excellent example of what can happen with an aggressive agent. Cherrington was sought out by a local Bangladeshi firm and was encouraged to bid on some contracts. The company currently has several million-dollar oil and gas contracts. U.S. firms also may wish to introduce themselves to the Bangladesh market by participating in the annual U.S. Trade Show, to be held at the Dhaka Sheraton Hotel, Jan. 30-Feb. 1, 1993. A list of key contacts can be obtained from Cheryl McQueen, Bangladesh Desk Officer in the Commerce Department's Office of South Asia, (202) 377-2954. This report was prepared by the U.S. Embassy Economic Section in Dhaka. The Multilateral Investment Guarantee Agency (MIGA), an affiliate of the World Bank, and the General Directorate of Foreign Investment (GDFI) of the government of Turkey, are organizing a conference which will bring together those who seek, and those who provide, specific opportunities for foreign investment in Turkey. The conference, "Turkey: A Strategic Investment," will take place Nov.